Do you love Pocoyo? We do! Pocoyo has been a mainstay in our home for many years now, so I was super excited to receive this DVD for review. Both my son, and his little sister, LOVE Pocoyo! Pocoyo is sweet little boy who loves to explore the world around him with his sweet friends- a bird, duck, elephant, and a puppy! I love how the narrator talks to both the viewing audience, as well as Pocoyo. This engages the child watching, and pulls them into to the story as an active participant. 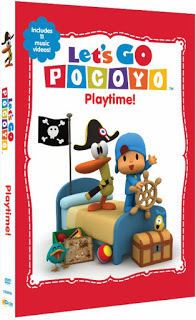 Check out Pocoyo for yourself, and let me know what you think in the comments!